MANITOU FIGHT! Chugan and Paws-Tread-Lightly face off on Chapter 9 Page 23. All the while, Blaise is wet and freezing. 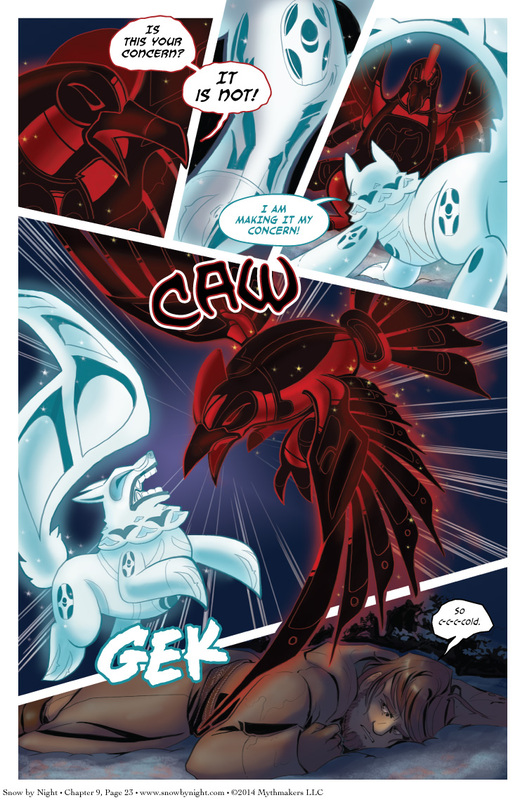 To see a preview of Monday’s page, please vote for Snow by Night on Top Web Comics. I’m pleased to announce that Snow by Night will be attending Annapolis Comic Con. This is a smaller, local convention in Annapolis, Maryland. Come for the comics; stay for the crabs! Or oysters. Oysters are delicious too and have a small guest role in the comic. Gorgeous! Love the designs here. Oh, so THAT’S what the fox says. Man Freezing to Death, Guys! Hopefully there is a local tribe nearby that will find him…and quick! Even better would be a tribe with a handy battery-powered electric blanket! Have to wonder what a native passing by would make of this. Sensible ones would run.